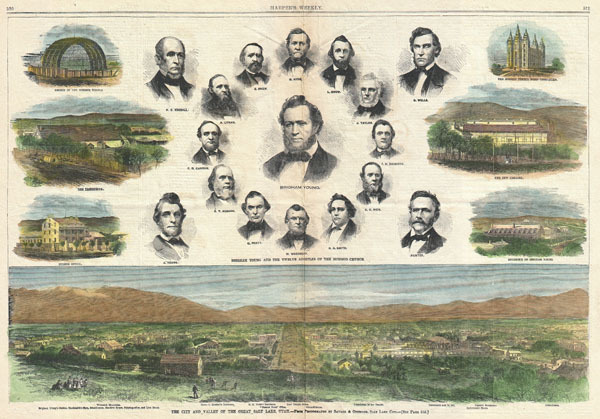 A handsome view of Salt Lake City, Utah from the August 1866 issue of Harper's Weekly. Offers a panoramic view of the city as well as six smaller views of important Salt Lake City buildings, including the Tithing Office, The Tabernacle, the Arches of the Mormon Temple, the Mormon Temple when Completed, the New Theater and the Residence of Brigham Young. Also offers portraits of sixteen important early leaders of the Mormon Church, including Brigham Young. Various important buildings are noted in the view. Most of the images on this page were based on photography by the early pioneers of Western photography Savage & Ottinger. Charles Roscoe Savage (August 16, 1832 - 1909) was an important English ambrotypist and photographer best known for his work in the American West. Savage had a difficult childhood and suffered in extreme poverty working numerous menial jobs in his home city of Southampton, England. Around 1848 Savage attended a lecture on Mormonism and, inspired, converted to the faith. His devotion to the ideals of Mormonism led him to be disowned by his family. Nonetheless, through his Mormon connections, Savage found his way to New York where he worked in a printing office. He was inspired to photography by the work of Thomas B. H. Stenhouse. In 1859 Savage joined Captain Brown's caravan to Salt Lake City, where he settled and set up a photography studio with Marsena Cannon. There he also met and began working with painter Charles Ottinger who tinted Savage's photographs. Savage was inspired by the people and places of the American West and it is these photos, discovered by New York Publisher Sameul R. Wells, that made his name. Wells who sold the Savage & Ottinger photographs to newspapers and magazines such as Harper's Weekly and the London Illustrated News. Savage & Ottinger ended their short and tumultuous business partnership in 1864, though it is during this time that Savage produced much of his most important work. Savage was awarded prizes for his photographs in several World Fairs including Chicago, St. Louis and San Francisco. Sadly much of Savages photographic work was destroyed when a fire struck his studio in 1883. Savage died in Salt Lake City on February 3, 1909. Harper's Weekly, August 18, 1866 issue. Very good condition. Original centefold. Minor age toning. On newsprint. Text on verso.